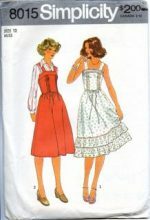 1970s Sewing Pattern for Floor or Knee-Length Bib Jumper, Knee-Length Skirt in Size 12. 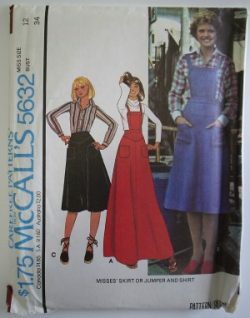 Both with Front Yoke, Patch Pockets. Long-Sleeved Shirt with Back Yoke. Never used. Uncut and factory folded. 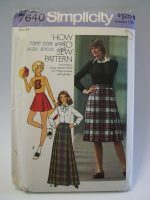 Like new patterns and instructions. Envelope in good condition. Slight water stain, edges and corner wear. Note: Sizing measurements have changed since 1977. Photo of measurement charts on the back available on request.